Click either image above to go to the site for that game. Our Alternate Reality Games (ARGs) represent an effort to bring underrepresented populations into STEM fields by engaging them in the uniquely immersive gameplay of ARGs. These games ask players to incorporate and imagine gameplay as it takes place in their day-to-day lives, encouraging them to co-construct the fictional storyline as they play along, and to collaborate with hundreds or thousands of other players dedicated to the same tasks. Our primary audience is teenagers (13-17 years old), including those currently underrepresented in STEM (e.g., females, blacks, and hispanics). Our ARGs inspire players to take on the roles of real life scientists, programmers, engineers, technicians, artists, writers, and explorers as they solve challenges and immerse themselves in the storyworld. This project represents a multidisciplinary partnership with the National Science Foundation (award number 1323306), as well as Brigham Young University, NASA, Tinder Transmedia, Intuitive Company, and the Computer History Museum. Our ARGs bring academic researchers, writers, artists, scientists, transmedia producers, and players together as part of a larger design team. Our project has been divided into two distinct games: DUST and The Tessera. Both games approach similar research questions and goals: how do we best design ARGs at scale in order to create meaningful and effective learning experiences for populations who are traditionally underrepresented in STEM fields? We have chosen the ARG genre of play to tap into the highly immersive and massively collaborative experiences that ARGs offer. Since the very fabric of ARG gameplay is woven into everyday life, these games invite players to imagine themselves as real scientists, technicians, engineers, mathematicians, designers, inventors, and programmers. The co-created narrative of an ARG also taps into skills from the humanities and information studies, allowing players to analyze images, compose arguments, and research outside sources for evidence. Two of our CoDesign Participants participating in a design session for DUST. As research projects, our ARGs give us unique opportunities to combine a number of rich data sources: social media analytics, player interviews, trace data from our web platforms, learning science data, field notes of gamerunners and administrators, as well as (importantly) the user generated artifacts and discussions that occur as a result of gameplay. Our design philosophy blends traditional game design approaches with Cooperative Inquiry, bringing in stakeholders and co-designers from our target demographic in order to create games that meaningfully connect to their lives. Because we are operating from a co-design methodology, we can use our co-design sessions as an opportunity to draw our designers into STEM pathways through the act of design. Our games are also designed for replayability. Often times ARGs are one-time affairs, due to their scope and the labor intensive nature of their operation. However, both of our ARGs are being designed with replayability in mind. This yields a version of the game that can be run by educators, librarians, museum personnel, and after school program coordinators. The replayable versions of our games will allow us to examine the ways that the ARG experience might be replicated in replayable modules in order to expand the potential scope and impact of future educational ARG endeavors. In all of our ARGs we aim to embed meaningful learning assessment directly into the game. Rather than conducting assessment after the learning event or interaction, like the traditional quiz or test, we aim to find ways to integrate the assessment intrinsically, into the ARG storyline and player activities, so that the core ARG mechanics are tightly coupled to our learning outcomes. For example, a player might complete a logic puzzle that requires computational thinking skills to gain a clue that helps to advance the narrative, or they may be asked about their attitudes towards science by a question posed through an in-game character. By creating aspects of our games with learning assessment in mind, we are able to get a step by step picture of learners as they move through the game, helping to further understanding of how informal learning occurs around STEM topics, especially among underrepresented populations. By implementing games that are meaningful and fun for their players, designing alongside our target audience, and creating games for replayability, we hope to expand the tools available to educators who are passionate about creating more inclusive STEM educational environments. We are also working with undergraduate and graduate students at Brigham Young University’s Laycock Center, a production company called Tinder Transmedia, scientists at NASA, curators at The Computer History Museum, the National Science Foundation, and many teenaged co-designers from all across the country. Former team members include, Carlea Holl-Jensen and Noa Saunders, both from the University of Maryland’s English Department, who worked as graduate student planners, researchers, and writers for DUST. As well as an undergraduate volunteer, Chris Robeck. “When the dust falls, will you?” This is the tagline that introduced our audience to our game, and served as an invitation to young learners to take on a challenging series of tasks related to nothing less than saving humanity. 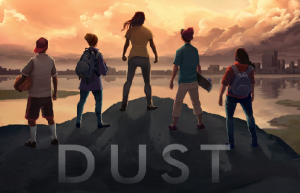 DUST follows the story of a group of diverse young people who are visiting a NASA research facility to watch a once in a lifetime meteor shower. However, as the rocks streak across the sky, they begin to release a mysterious dust, and at the same time adults across the world begin to collapse. Our players followed along with the teens at the Kennedy Space Center as they answered a number of questions: did the dust cause the collapse? how long do the adults have left to live? how can we understand and begin to fix this terrible catastrophe? Throughout the game we asked our players to take scans of collapsed adults in their lives using a mobile phone application (and a little imagination), analyze scientific data to find the source of the meteors, and formulate solutions to problems as diverse as broken telecommunication equipment to decrypting a message contained in alien DNA. The game ran throughout the spring of 2015, and we have developed a replayable version of DUST which may be used in a number of educational settings (e.g. schools, museums, after school programs, libraries) in order to expand the scope of the original ARG, and to share DUST’s learning potential with students across the world. You can view the trailer for DUST below. You can visit DUST’s homepage here. 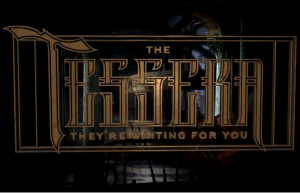 The Tessera summons players with the tagline, “They’re waiting for you.” This mysterious sentence evokes an alternate reality where young inventors and innovators must fight against a shadowy opponent, representing entropy and chaos. Players are invited to work alongside an organization known as The Tessera, which counts among its members some of the most brilliant minds in the history of computers, including Ada Lovelace, Charles Babbage, Grace Hopper, and Alan Turing. The Tessera game will launch in summer of 2016, and asks young thinkers to engage with the history and technology of computers, from the ‘poetical science’ of Ada to modern day systems which fit in the palms of our hands and allow us access to nearly unlimited information. Based around computational thinking, the Tessera’s gameplay will put players into the roles of programmers, engineers, and designers. Players will enter the mysterious, gothic world of Horsley Towers (based on Ada’s real life home), and will move up through levels of the tower by engaging with puzzles and exploring richly detailed environments. Players can interact with The Tessera through its online game environment, at a specially designed experience at the Computer History Museum in Mountain View California, and in a number of other formats, including real life events and physical card games tied to the larger narrative. You can view a brief trailer for The Tessera below, or you can check out its informational site, here. Pellicone, A. Bonsignore, E., Kaczmarek, K., Kraus, K., Ahn, J. & Hansen, D. (Forthcoming). Alternate reality games for learning: A frame by frame analysis. In A. Garcia & G. Niemeyer (Eds. ), Alternate Reality Games and the Cusp of Digital Gameplay. New York, NY: Bloomsbury. Pellicone, A., Bonsignore, E., Kraus, K., Kaczmarek, K., Hansen, D., Ahn, J. (2016). Sketchventor: The creation of a design centered game. Submitted to the 2016 InPlay conference. College Park, MD. Kaczmarek, K. Adapting DUST: Replayability of Educational Alternate Reality Games (2016). Submitted to the 2016 InPlay Conference. College Park, MD. Kaczmarek, K. “Storytelling as Knowledge Production in Educational Alternate Reality Games”, 2015 Universitas 21 Graduate Research Conference: Digital Future, Jiao Tong University, Shanghai, China. Award for Best Oral Presentation. Pellicone, A., Bonsignore, E., Ahn, J., Kaczmarek, K., Hansen, D., Kraus, K. (2016) The social shape of DUST: Learning networks in alternate reality games. Submitted to the 2016 iConference. Philadelphia, PA.
Hansen, Derek. Research Revolution: BYU’s Alternate Reality STEM Game DUST. April 2, 2015. Orem Library, Orem, UT. Hansen, Derek. Mixed Reality Education: Integrating narrative, learning, and fun. December, 14, 2015. Join CASCI/HCIL Talk. University of Maryland, College Park, MD. Hansen, Derek. Mixed Reality Education. February 2, 2016. Instructional Psychology and Technology Seminar. Brigham Young University, Provo, UT. Awards: Award for Best Oral Presentation. “Storytelling as Knowledge Production in Educational Alternate Reality Games”, 2015 Universitas 21 Graduate Research Conference: Digital Future, Jiao Tong University, Shanghai, China. Awarded to Kathryn Kaczmarek.